The award-winning movie Sully, staring Tom Hanks as US Airways Capt. Chesley “Sully” Sullenberger, reminds us of a good-news story at the time of the financial crisis when there wasn’t much good news around. It also reminds us of the work of an institution that has made an enormous contribution to safe airline travel – the National Transport Safety Bureau. “MAYDAY, MAYDAY, MAYDAY. This is Cactus fifteen forty-nine. Hit birds. We’ve lost thrust in both engines. We’re turning back towards LaGardia”. This was the brief emergency call made to the New York Terminal Radar Approach Control (TRACON) at 3.27pm on Thursday, 15 January, 2009. In more than twenty years of flying commercial aircraft, the pilot making the call had never experienced such an event and had never even made a MAYDAY call. This was to be the most testing day he and the rest of the passengers and crew had faced in their lives and an experience they would never forget. Only half an hour earlier the US Airways Airbus A320 had been prepared for departure at New York’s LaGuardia airport. It was a bitterly cold Thursday afternoon. Snow had been falling earlier in the day and had cleared by afternoon with patches of cloud. In the cockpit were the two pilots – Captain Chesley “Sully” Sullenberger and First Officer Jeffrey Skiles. They had met for the first time earlier in the week when they started the week’s schedule. Even though both pilots had been with the US Airways for many years, it’s not uncommon to find in a company with about 5,000 pilots that the crew members have not met each other before. Also on board were three long-serving Flight Attendants, Sheila Dail, Doreen Welsh, and Donna Dent and a full load of 150 passengers. Flight 1549 was bound for Charlotte, North Carolina with a scheduled flight time of 1 hour 54 minutes. As the aircraft was pushed out from Gate 21 at 3.04 pm, Sullenberger started the engines and then proceeded to taxi to the holding point adjacent to Runway 4. As they taxied, First Officer Skiles went through the checklists in preparation for takeoff. Reaching the holding point, Sullenberger then transferred control of the plane to Skiles as it was his turn to take charge. With other aircraft in the queue and snow clearing operations underway on the runway, it was 3.25 pm before the Tower gave the clearance for takeoff. As the aircraft surged down the runway under full power Sullenberger monitored the speed and 23 seconds later he called for Skiles to rotate the aircraft for a 15 degree climb to 5000 feet. As they climbed over the Bronx everything was going smoothly and Sullenberger even made the comment, “What a view of the Hudson today.” Thirty-three seconds later and at an altitude of just under 3000 feet Sullenberger saw the windscreen darken with the shape of birds right in front and called out “Birds”. Skiles has already seen them – a line of them in formation but it was too late to avoid them. Estimates suggest there are 6 billion birds in the United States. The first reported bird strike by an aircraft was with one of the early flights by the Wright brothers in 1905. Since that time thousands of bird strikes have been reported in the USA with over 7,500 strikes in 2008 alone. Damage due to bird strikes is frequently minor but can sometimes be very costly and even catastrophic. A Canada Goose is a big bird. The average weight is around 12 pounds (5.5 Kg) and its wingspan can be up to six feet (1.8 metres). Canada Geese are among the millions of migratory birds that travel through the New York region each year during winter as they make their way south from Canada. They fly in a Vee formation and, given a favourable wind, they can cover 1,500 miles (2,400 km) in just 24 hours. There are also thousands of Geese that have made a permanent home in the land around New York’s airports despite being discouraged from doing so. In the case of Flight 1549 subsequent laboratory tests showed that the birds were migrants heading south from Canada and there’s little that can be done to stop them. It’s their world too. Modern commercial jet aircraft, such as the A320, use turbofan engines. These engines have a turbine jet engine at its core with a turbine-driven fan at the front – the fan blades that are visible when viewing the engine intake. The large amount of air sucked in by the fan mostly bypasses the jet engine to mix with the high speed air from the turbine jet engine resulting in a composite engine with higher thrust, better fuel efficiency and quieter operation. With the majority of the reported bird strikes there has been little engine damage. In these instances the fan blades act as a food processor and the bird ends up as a smelly soup which bypasses the core turbojet engine before being discharged out the rear of the engine. However when a large bird enters the core turbojet engine severe damage will occur. Before an aircraft engine can be certified for commercial use, manufactures have to demonstrate the engine can pass a “bird strike” test. This involves having dead birds weighing up to 5.5 pounds fired at high speed into an engine running at full power on a test bench. Currently, to pass the test for an A320-size engine, it must keep operating at 50 percent thrust for 20 minutes to allow time for an emergency landing. The noise of the birds hitting the A320 aircraft was louder than any severe storm Sullenberger had witnessed growing up in Texas. He could also feel the vibrations as the engines were damaged and shortly after there was the smell of dead birds. His first thought was this can’t be happening and he then realised this was going to be the most challenging day in his life particularly when they were at a low altitude over one of the most densely populated areas on earth. Being in a climbing attitude with diminishing trust from the engines meant the forward speed of the aircraft was rapidly decreasing and a minimum amount of speed is required to keep a plane in the air. The first thing a pilot must do is to control the aircraft, so Sullenberger issued the command using the standard protocol, “My aircraft” and Skiles responded to acknowledge by saying, “Your aircraft”. Sullenberger then used his side stick to put the now silent aircraft into a glide. Although the left engine was heavily damaged, it was operating at reduced thrust and still generating the electrical power to operate the electronic flight systems. Nevertheless Sullenberger started the Auxiliary Power Unit – a small jet engine at the rear of the plane to provide electrical power just in case the left-hand engines failed completely. That part was simple for Sullenberger. Now came the next thing a pilot must do: find a safe place to land while attempting to restart the engines. Fortunately, both pilots were very experienced with each having over 20,000 flying hours and knew what they had to do. Jeff Skiles, 49 at the time, had caught the flying bug as a youngster from his family. Both his father – a professor at the University of Wisconsin – and his mother were private pilots and at different times had owned a Piper Tri-Pacer and a Cessna 182 for recreational flying. Skiles grew up in Monona, a suburb of Madison, Wisconsin, the state capital. He still lives in the area in the small village of Oregon with his wife and three children. From the age of five all he had wanted to do was to fly planes. He gained his pilot’s license at sixteen while a student at Oregon High School where he graduated in 1978. He then went on to obtain a Bachelor of Science degree in geology from the University of Wisconsin-Madison in 1984. Skiles worked his way into general aviation from the ground up, starting out as an aircraft refueller at the Dane County Regional Airport in Madison. He then worked as a flight instructor and flew for a cargo airline for a while before flying the 19-passenger Swearingen Metroliners for Midstate Airlines in Wisconsin. He joined US Airways in 1986 as a flight engineer and co-pilot on the Boeing 727. He converted to the DC-9, also as a co-pilot, and became a captain on the Fokker 100, but due to an industry slump returned to the first officer ranks on the Boeing 737. Skiles’ most recent career change placed him on the training syllabus for the Airbus A-320. In fact this four-day schedule was his first after completing his training. Thus he knew exactly where to locate the checklist for restarting the engines – a futile exercise as it turned out. The Captain of Flight 1549, Chesley B. “Sully” Sullenberger, III, was born in 1951 in Denison, a small town of around 20,000 people in northern Texas. The town is famous for being the birthplace of the thirty-fourth president of the United States, Dwight D. Eisenhower. Sully’s father was a dentist who had served in the US Navy during World War II and his mother was an elementary school teacher. Growing up in a somewhat isolated place taught him to be self-reliant. From an early age he had a dream of becoming a pilot – no doubt influenced by seeing the fighter jets from the nearby Air Force base. The dream became his passion and with the encouragement of his parents he gained his pilot’s license at the age of 16. While still a student at Denison High School he applied for admission to the Air Force Academy in Colorado. Only top students with the recommendation of a Congressman, the Vice President or US President gain admission to this prestigious institution. Although it was only founded in 1954, it is run on similar lines to the West Point Military Academy which was established in 1802. Sullenberger was accepted and started his studies in 1969 and graduated in 1973 with a Bachelor of Science degree and a commissioning as an officer. He then went on to spend another two years at Purdue University gaining Masters Degrees before taking on active flying duties in 1975. During the period 1975 to 1980 he flew the F-4 Phantom II fighter while stationed at bases in North America and Europe. In 1980 Sullenberger became a commercial pilot with Pacific Southwest Airlines – later to become US Airways after a takeover. At that time commercial airlines were happy to hire Air Force or Navy pilots because they were experienced and well-trained flyers. And it was an attractive career change for these pilots because if they stayed in the military they would most likely end up in desk jobs. With his home in San Francisco, where he lives with his wife and two children, Sullenberger was all set to commute to San Francisco that evening once Flight 1549 reached its Charlotte, North Carolina destination. The public’s perception is that being a pilot is a glamorous, well-paying job, with lots of benefits such as cheap air fares for family members. This was true when pilots were compensated at the same level as medical doctors or lawyers but deregulation of the industry, starting in the late 1970s, the 9/11 attacks and technology advances has impacted the airlines and their employees as well as the travelling public. The life of an airline pilot has changed considerably over the last few years. While there is no shortage of young people who dream of a career flying airplanes, the reality is that being an airline pilot is no longer the glamorous occupation it was believed to be. The much-needed deregulation of the aviation industry starting in the late 1970s brought in reforms that allowed competition that has made flying affordable for millions of passengers. For example, the cost today a return airfare from Los Angeles to New York is less than one-fifth of the cost of the lowest fare available in 1974. Dramatic falls in passenger numbers occurred in 2001 and 2002 as the result of the 9/11 attacks and again in 2008 as the Global Financial Crisis hit the economy. The industry was profitable in 2000, then lost billions of dollars in seven of the next nine years. Each time cutbacks were made in the routes served resulting in layoff of airline staff. But there have been many unforeseen consequences for the industry, for airline workers and for the population at large. For example, nine major carriers have disappeared since 1978 – including Pan Am, at one time the leading airline worldwide – plus over 100 smaller airlines have gone into liquidation. Because of the cost-cutting by airlines due to competition, changes to working conditions and pay-cuts have led to great dissatisfaction by pilots. Long gone are the days when pilots would be given a meal during a flight – now they have to buy their own sandwiches. To make ends meet, Sullenberger had set up a safety consulting business on the side while Skiles spent his days off as a general contractor building houses. Advances in technology have also impacted pilot’s careers. With propeller-driven planes and earlier passenger jets it was normal to find three pilots, the captain, first officer and a flight engineer. There has even been talk of reducing the number of pilots to one – a move that is being vigorously opposed by pilots’ unions. And in the United States Air Force the ultimate has already happened – there are drones in use with pilots on the ground thousands of miles away. While technology has made flying a plane as easy as driving a car, takeoffs and landings are the most critical times for a flight. An engine failure on or shortly after takeoff is definitely a critical time for a pilot. After gaining control of the plane, Sullenberger’s next task was to find a place to land. His first option to consider was turning back to LaGuardia. Pat Harten, the TRACON controller on duty, gave him clearance for Runway 13 but Sullenberger was already making a turn in that direction which brought the aircraft toward the Hudson River. His main concern was whether he could glide to the runway and not crash into the wall at the end. The next option he considered was Teterboro Airport, a smaller airport to his right that serves mainly commuter and private planes. The controller gave him clearance to make an emergency landing on Teterboro’s Runway 1. 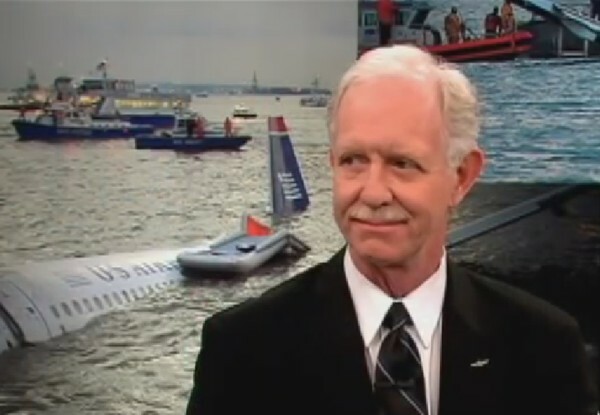 However Sullenberger quickly decided that his best option would be to land on the Hudson even though he had no experience of a water landing; pilots do not practice for such an event, even on a simulator. His next concern was whether he could make it over the George Washington Bridge. This landmark spans the Hudson River between Manhattan and New Jersey. In a glide and unable to climb it turned out that there was 300 metres clearance. Now for the landing. Sullenberger knew from studying the ditching of other aircraft exactly what he had to do. The wings had to be level or else one wing would slice into the water first, resulting in a cartwheel and breakup of the aircraft. The flight control systems of the A320 would take care of that automatically. Next, the nose needed to be at an elevated attitude so that the tail section would touch down first, and the speed had to be low but not too low or else the aircraft would descend too rapidly. This is where he had to concentrate and use all his flying skill to strike a balance between forward air speed, decent speed and aircraft attitude. Ninety seconds before touchdown Sullenberger made his only announcement to the passengers and crew in the main cabin: “Brace for impact.” He was relieved to hear the Flight Attendants follow up in repeating his command. Sully’s judgement during the last part of the glide was almost perfect. With the wheels still retracted and a nose-up attitude as in a normal flare on to a runway, the tail section was the first to touch the water. But hitting water at over 230 Kilometres per hour is like landing on solid ground. The underside of the belly ripped open and ruptured the cabin’s rear bulkhead. Doreen Welsh, the flight attendant stationed in the rear of the cabin suffered a serious leg injury from the damaged structure coming up through the cabin floor. Because of the depth of water there was no rear exit available. The elapsed time from the bird strike to the touch down at 3:30 pm was 3 1/2 minutes and the total flight time was just over 5 minutes. Up at the front of the cabin evacuation of passengers was underway first through the over-wing exits on both sides of the aircraft and via slides through the front doors. With water rising rapidly the passengers were remarkably calm. Some even stayed behind with the crew helping others and handing out life vests. Four minutes after coming to a stop the first of the ferries, the Thomas Jefferson, came alongside to rescue passengers. By 4:20 pm all 150 passengers and crew had been rescued with Sullenberger the last to leave the aircraft. Four passengers had serious but not life-threatening injuries. The landing didn’t go unnoticed. Barbara Sambriski, a researcher at The Associated Press office at 450 West 33rd Street, Manhattan, couldn’t believe what she was seeing. “I just thought, ‘Why is it so low?’ And, splash, it hit the water,” she said later. Within minutes the world would hear about it. By 3.42 pm NBC were showing live video of the rescue in progress and other TV stations soon followed suit. The media couldn’t get enough of the story. Passengers praised the skill of the pilot in saving their lives and he was spoken about as a hero. As it turned out, this didn’t sit comfortably with Sullenberger as he simply believed he and his crew and the others involved in the rescue were simply doing their jobs. For the next few months Sullenberger and his family had to endure a tsunami of media attention while at the same time he and other crew members had to face a lengthy investigation by the National Transportation Safety Board (NTSB). Some aviation “experts” and pilots believed Sullenberger could have made it safely back to LaGuardia Airport. But later simulations confirmed the aircraft would not have reached the runway. Others said he should have been looking out for birds instead of gazing down at the Hudson River. But the public were having none of it – Sully was a hero. Period. It took 16 months before the final report was released by the National Transport Safety Bureau. Referring to the Can-Do Wisdom Framework diagram above, the US National Transport Safety Bureau (NTSB) is a social system operating in the We Do quadrant. Its origins go back to 1926 with the idea we can learn why an aircraft crash occurred and we can make recommendations that would prevent it happening again (the We Can quadrant). In 1974 was made into a fully independent entity responsible for investigating every civil aviation accident and now all significant highway, marine, railroad, pipeline, and hazardous-materials accidents. Its role is to determine the probable cause of each accident investigated and issues safety recommendations aimed at preventing future accidents. Since its inception it has investigated more than 137,000 aviation accidents and have issued a total of more than 13,700 safety recommendations. However, to maintain its independence, it has no authority to implement these recommendations. The NTSB is recognised as one of the most efficient and effectives entities in the US Government. With only 400 employees in its Washington, DC headquarters and regional centres across the country, it is successful because of its unique way of operating. The five board members are nominated by the US President and approved by the Senate. Strict conditions apply to ensure their suitability and independence. They have almost no involvement in the internal operations of the investigating teams other than to vote on the probable causes of accidents and recommendations in reports produced by the investigating teams. These board meetings are public to ensure transparency. Because the wide range of skills required in conducting detailed, complex investigations, the NTSB supplements its own experts with external parties, again under strict conditions to ensure there is no bias. The task of this stage of the investigation with other parties is to gather the facts. The next stage of analysis and drawing conclusions is purely an internal NTSB activity. Due to the fact the NTSB has no formal authority to regulate the transportation industry, their effectiveness depends on their reputation for conducting thorough, accurate, and independent investigations and for producing timely, well-considered recommendations. This is why NTSB staff were upset at the way they were depicted in the movie, Sully. This was a totally inaccurate way of depicting what happens in an investigation. The final report said the decision-making of the flight crewmembers and their crew resource management during the accident sequence contributed to the successful outcome. The report also identified “fortuitous use of an airplane that was equipped for an extended overwater flight, including the availability of the forward slide/rafts, even though it was not required to be so equipped.” It is estimated that at least 60 lives would have been lost if this equipment was not available. There were 35 recommendations made in the report. As of September 2016, only six have been implemented. One of the frustrations for the NTSB – and other interested parties – is the time taken to implement recommendations. It’s obvious then that the movie makers needed to insert a villain for dramatic effect. They succeeded. But it does paint the NTSB, an excellent and highly respected organisation, in a poor light. During the NTSB public hearing in Washington DC on June 9, 2009, the Chairman described the “choke factor” whereby a pilot normally demonstrates a startled response to an unexpected event and there is a delay before acting. The Chairman wanted to know how it was that, immediately after the bird strike, Sullenberger had turned on the engine ignition and the Auxiliary Power Unit (APU) – two critical actions – without the “choke factor” being evident. These were just two of the many wise decisions made in the next few minutes. Why had Sullenberger, in particular, acted in the way he did? The brief answer is experience, but it requires a more in-depth look. 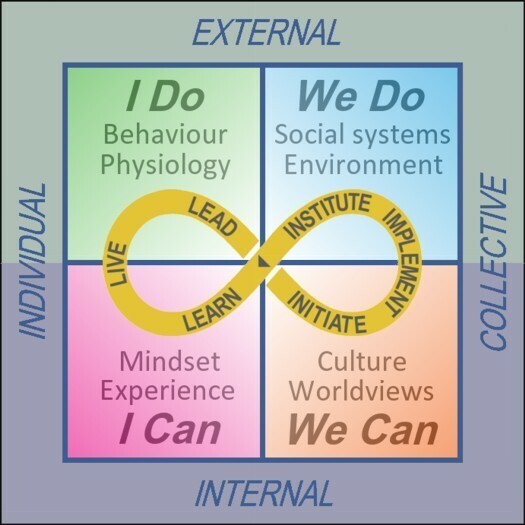 Referring to the Can-Do Wisdom Framework shown above, Sully, like any individual, operates in the I Can and I Do quadrants. Even though he had never faced a problem like this before, or even had training for such an event, he had built up enormous capital and potential energy in the I Can quadrant though his attention to Live, Learn and Lead. The way he lived his work life was one aspect. He saw his job as an airline pilot to fly the aircraft safely, delivering passengers to their destination. He felt good each time he did that. He was passionate about safety, dating back even before his Air Force days. When he was a boy, his father impressed upon him that a leader’s job is “full of challenges, and his responsibilities are almost a sacred duty.” He remembered these words throughout his career as a fighter pilot and as a commercial pilot. He describes himself as a “man of routine” and his exacting approach has made him a better pilot. This is how, during the glide to the Hudson, he was able to shut out all distractions and concentrate on flying the crippled plane. When he graduated from the Air Force Academy in 1973, he was named “Outstanding Cadet in Airmanship.” This is not surprising as he had spent hours honing his flying skills when others figured they’d done enough. He was therefore confident he could land the plane safely on the Hudson even though this was a completely new experience. One part of learning involves both appreciating the immediate, current environment, that is, having situational awareness. This means you are able to create a continually evolving mental model of your reality—the airplane, the environment, and the situation. This is particularly critical in the Air Force when you’re on a mission flying 100 feet above the ground to avoid enemy radar and clearing hilly terrain in front of you. This situational awareness capability was needed when Sully lost power and had to quickly cycle through several scenarios of attempting to return to LaGardia, or try Teterboro airport or the Hudson. Learning also comes from reflecting on what has happened in the past and learning the lessons, both from his own actions and those of others. For example, he has spent years studying accidents, starting with investigation work while in the Air Force. He knew, for example, the need to keep the wings level when landing on water because he’s seen other instances of aircraft cartwheeling and breaking up if one wing touched first. Pilots have procedures for each phase of a flight, such as pre-flight, before start, after start, before takeoff, etc, and checklists to check that the procedure has been completed. Pilots are taught to use the correct procedures but not always why these procedures are important. Sully understood the ‘why’ very well and was able to perform the critical actions of engine ignition and start the APU immediately the engines failed. He also studied leadership. He even had three books on safety management from his local library with him on Flight 1549. They were eventually recovered and although water damaged they are now back in the library in a display case. In the I Do quadrant, Lead is aligned with doing. This is where an individual functions in the real world and interacts with others to varying degrees through speaking, through writing or physically acting. Before Flight 1549, one of Sully’s proudest achievements was to play a role in introducing Crew Resource Management (CRM) into Pacific Southwest Airlines (later to become US Airways). CRM is a training program now used by all major airlines CRM focuses on interpersonal communication, leadership, and decision making by all crew members. He was one of the course developers as well as being a course leader and taught CRM to hundreds of students. In Sully’s case, he had three things to concentrate on in the emergency: maintain aircraft control, analyse the situation and take proper action, and land as soon as conditions permit. The two pilots worked together in the cockpit with only essential verbal communication taking place between them. Skiles job was to go through the checklist to recover from engine failure. They could see and hear what each other was doing and saying and there was no need for any further discussion. And yet in many radio and television interviews since the Flight 1549 incident, he has been able clearly articulate what a pilot does and how the crew worked together on that day. In conclusion, this case study of Flight 1549 demonstrates the Can-Do Framework in action. The flight was only five minutes long and the rescue was completed in less than an hour, but the preparation for this successful outcome was years in the making. For Sully it was his whole life, starting with his upbringing and his values. The unrecognised hero in the Sully movie is the NTSB, which, since its inception in 1926, has focused on improving flight safety year after year, case after case. Posted in Decision making, Wisdom and tagged Chesley “Sully” Sullenberger, Chesley B. Sullenberger, Clint Eastwood, Flight 1549, Hudson River, Jeffrey Skiles, miracle on the Hudson, NTSB, Sully, wisdom. Adrian, your “Can-Do Wisdom” holistic frame work for managing change is a thought provoking and enlightening piece of work. Unfortunately, all too often many major corporations have failed and continue to fail in connecting the links between each quadrant, resulting in mass industry collapses and off-shoring of work to the detriment of our citizenship, in particular worsening employment prospects for future generations. In my 40 years of professional life in the Australian airline industry I’ve witnessed a relentless and continuous decay of collective wisdom due to industry leaders’ disconnects with individual efforts to improve the efficiency and competitiveness of our local aircraft maintenance facilities. This of course is not confined to just aviation as we’ve seen many other industries go off shore or outsourced such as car manufacturing and Information Technology. As Jane Goodall lamented, “it’s now all about making money and maximising profits for share holders”; there’s no leadership from industry or government who seem to be short-sighted and have no vision whatsoever for the collective good of our society. Not to say that globalisation is necessarily failing us. Indeed, it is our failure to innovate and develop a competitive advantage that is hurting us. Diminishing lack of quality education, innovative policies and brave local investment are our weaknesses. Sully was certainly the hero here, highlighting another worrying trend in our society, the ‘youthification of the workforce’. The skill and wisdom displayed by Sully could only have been achieved with life long commitment and dedication to his craft…..an extended career in the one industry with life long learning. The modern propensity that today’s youth is showing for changing jobs every 18 months or so is seriously eroding their ability to accumulate a level of expertise in anything at all. This trend means that future generations may not be conducive to a pilot having the wisdom and skill levels of a Sully. The ‘Bite size’ / 24hr news cycle is not helping either as thoughtful, collective wisdom takes a back seat to quick wins and heresay reporting….short term self gratification and collective wisdom just doesn’t add up! Anyway, love your work! Please keep elaborating on this intriguing concept because the world needs it…..and it’s interesting. Hi Joe, Thanks for the comments. I can’t agree more with what you say. However there is hope if we see more social entrepreneurs take up the challenge in areas that governments and business are unable or unwilling to address. That’s the subject of my two most recent posts.